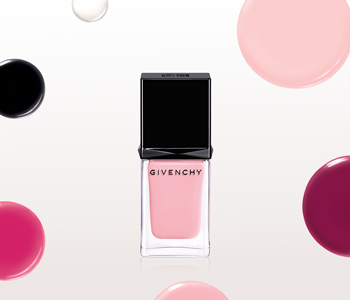 Find the perfect polish to match your wardrobe with the GIVENCHY Nails Collection, a lineup of glossy formulas presented in a chic bottle engraved with the emblematic 4G logo. Whether you want a vibrant pop of colour or something a little more subtle, Le Vernis expertly designed wide and flat brush will spread to cover the entire surface of the nail in one coat, offering extreme precision every time. For nails that are elegant, couture and always statement-making; add a refined touch to your signature look with this coveted collection.